I was contemplating what to blog about today when it quite literally hit me! My seat-mate on my Southwest flight knocked me in the head with her Spirit Magazine as she was pulling it out of the seat-back pocket. So, I had a quick read and encountered one of my favorite concepts … girl power. 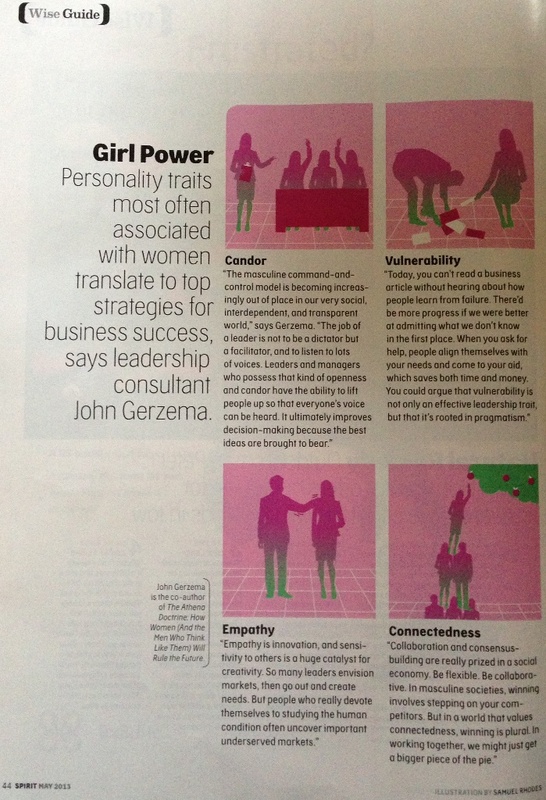 Personality traits most often associated with women translate to top strategies for business success, says leadership consultant John Gerzema. John Gerzema is the co-author of The Athena Doctrine: How Women (And the Men Who Think Like Them) Will Rule the Future. Those of you who know me will wonder what on earth I am doing referencing The University of North Carolina when my alma mater and my husband’s alma mater are pretty far removed and often bitter sports rivals with this school. Be honest with your players. Recruit unselfish players and make sure they are compatible with your philosophy. Respect your players; never embarrass or criticize them in public.